What a weekend for North America! It has to be said, so I”ll get it out of the way right at the top: the turn the World Cup takes through Russia is generally not fully attended and this year was the same, although perhaps not as dramatically as before. But there were plenty of notable absences, particularly on the men’s side. Of course, I don’t think any of that makes 100 World Cup point any less sweet for Devon Kershaw. Not one bit. Notice that Dahl isn’t shown, since he was relegated in the final to 6th, so he wasn’t given a time in that heat. In what will perhaps become a theme for these races, it might not have been ideal for Kershaw to have won the qualification round by 1.5 seconds or so. 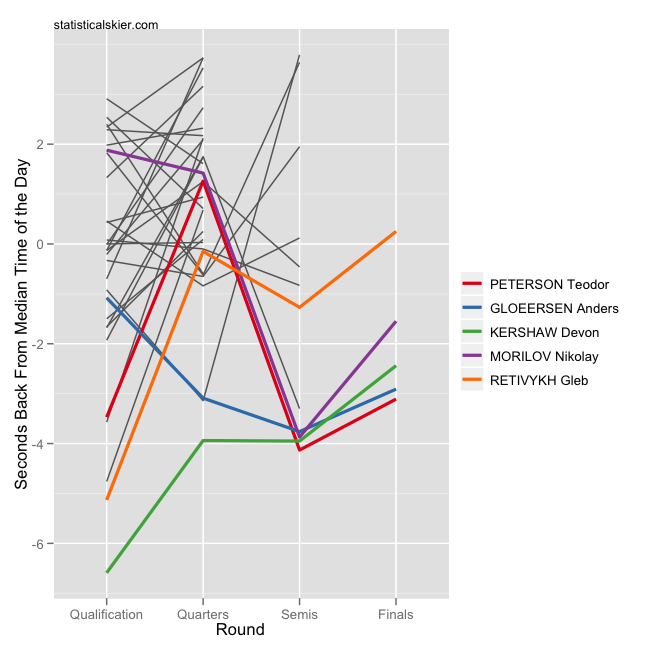 Petersen skied considerably slower in qualification and the benefited from a rather slow quarterfinal. Much of the pacing between round a racer doesn’t have much control over, of course. Backing off a bit in qualification has significant risks, and once you’re in the heats, you can’t guarantee that you’ll be able to control the pace; the other 5 skiers have some say in that. So there ends up being a certain amount of luck involved in these sprints, which is one of the reasons I’m not as passionate about them as I am the distance events. Remember that Dahl was the other person to advance from Semifinal 2, but he was relegated so didn’t get a time in the final. Semifinal 1 was dramatically faster than Semifinal 2, and yet the folks from 2 ended up doing uniformly better. Now, maybe this has more to do with the overall abilities of the actual skiers in each heat. But at the very least it cuts against my feeling that lucking into a slow heat can be significantly beneficial. As with Kershaw, it definitely seems likely that Diggins could have benefitted from not crushing qualification quite so much. 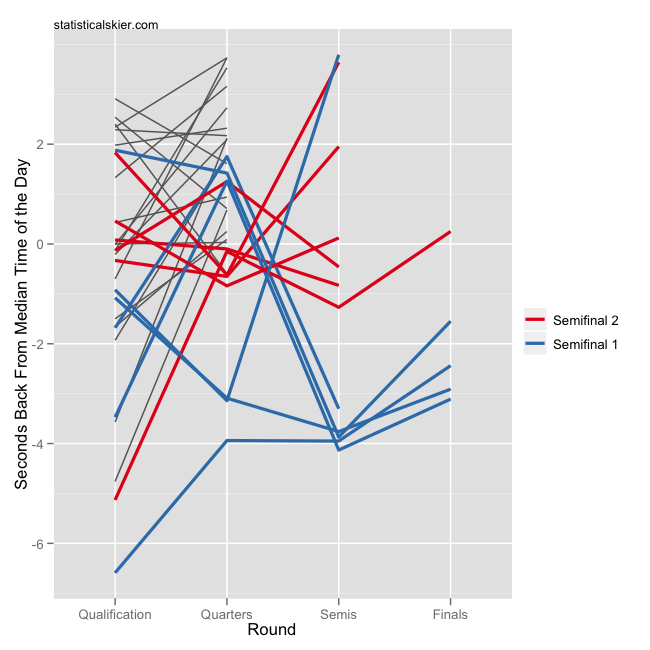 In particular, note that unlike with the men’s race, the women’s qualification time were generally quite a bit slower than all the subsequent heat times. This result makes Jessie Diggins the 13th skier (male or female) that I can find with a result of 6th or better in a World Cup level (WSC, OWG, etc.) sprint race by the age of 20. If you reach back to the olden days of sprinting you pick up another four, including Pirjo Muranen. This list includes folks like Petter Northug, Maiken Caspersen Falla, Celine Brun-Lie, Astrid Jacobsen, Hanna Falk and Hanna Brodin. Not bad company. Of the modern era sprinters in this group, nearly all of them went on to podium at least once. So things are looking good for Diggins. 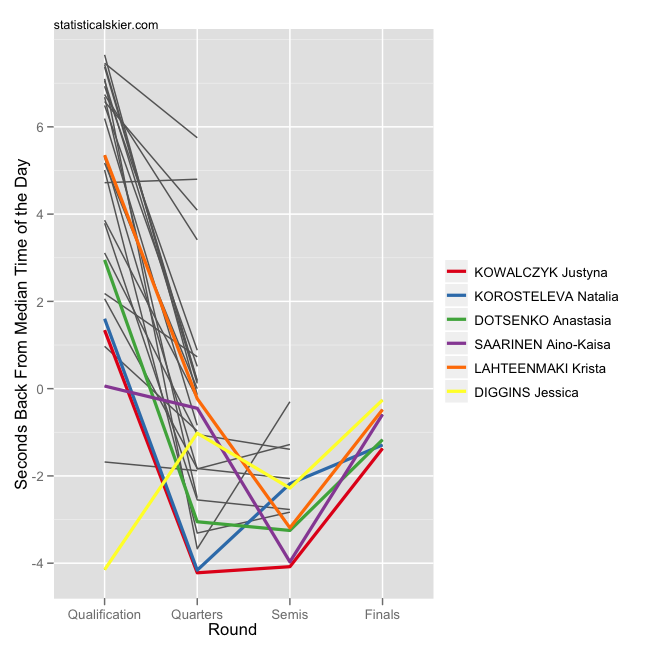 With all the focus on Diggins, it may be easy to miss that this was also a career best sprint result for Lahteenmaki and Dotsenko, and season best sprint results for Saarinen and Korosteleva. Posted by Joran on Monday, February 6, 2012, at 6:00 am. Filed under Analysis, Cross Country, Race Recaps. Tagged devon kershaw, jessie diggins, men, moscow, race recap, Sprint, women, World Cup. Follow any responses to this post with its comments RSS feed. You can post a comment or trackback from your blog.